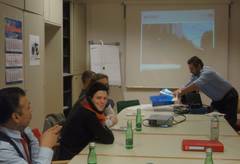 As the first ACTUATE project partner, Salzburg AG held training sessions for more energy-efficient and safe driving of clean vehicles this week. During the last three days 36 trolleybus drivers have participated in the training already. Prior to these trainings all driving instructors and the executive staff holding a trolleybus license were trained as multiplicators. In total more than 300 drivers will be trained just in Salzburg. Together with the formal education on safety and technical issues of trolleybuses, the practical part of the training has been receiving very positive feedback from the participants. As a result of the training, inefficient driving habits were reduced and energy consumption went down by as much as 25%. Of course these results still need long-term validation, but the ACTUATE trainings are off to a very good start.